For our Enjoying Britain travels in July 2017 we watched the Masham Steam Engine road rally, and then had a a trip to Whitby, which included staying at Ruswarp Hall, a picnic at Sandsend, a return journey on the North Yorkshire Moors Railway (NYMR), and a visit to Eden Camp at Malton. Pru and Robert’s house overlooks the market place at Masham where the steaming, clanking cavalcade was gathered in for a display of engines ranging from the big road locomotives such as the 1913 Burrell proudly displaying its Prestons of Potto livery and large steam rollers, to the “miniature” versions which were still capable of conveying several people. To add to the fun there were steam lorries plus vintage tractors and cars. There was a great sense of community, not just around the town but also among the participants as they have got to know each other so well during the many years that they have met at the various steam rallies in and around Wensleydale. That in Masham began in 1965 as a way of raising funds to maintain the town hall. It is held in neighbouring fields over a weekend in July each year with many of the participants joining the road run late on Saturday afternoon. Many of the drivers of those majestic engines can’t leave the market place without a loud whistle. Once most of them were gone Pru and Robert made sure we were well fed. None of us were in a hurry to leave! Two days later we were on the road to Whitby as we had booked for a return trip on the North Yorkshire Moors Railway (NYMR) on the Tuesday – something we had been promising to do for several years. As we headed towards Masham we met another procession – this time of vintage and classic cars including Austin Sevens, a Daimler Dart, an Austin Healey and a Triumph Spitfire. We wondered if they were on their way home from the Historic Vehicle Rally at Newby Hall the previous day. The slowest vehicle returning home was the steam roller heading for Woodhall. It was a glorious sunny day and so it wasn’t surprising that Thirsk town centre was very busy with far too many pedestrians not checking carefully before they cross the road in front of us. Once we had ascended Sutton Bank we decided we did not want to follow the main road. So just after Kirkbymoorside we turned off and headed for Hutton-le-Hole. Its picture-perfect green dissected by Hutton Beck, the pub and the cafes were very inviting, as was the Ryedale Folk Museum, but we did not stop but rather took the moor road over Blakey Ridge. Ewes and lambs provided a sharp contrast in colour against the purple heather blossom as we climbed towards the Lion Inn, the 16th century pub at the highest point in the North Yorkshire Moors National Park (1325ft). There were glorious views over Farndale and Rosedale but yet again we decided to keep going. The hall was built in 1873 as a meeting place for the Loyal Order of Ancient Shepherds. If shepherds have to be fit to follow their flocks then the waiters at this tea room have to be equally fit. The kitchen is on the ground floor, with the main dining area upstairs, and the two others out in the garden (one overlooking the river). David thoroughly enjoyed his panini and I was so impressed at how the staff happily assisted me with finding something I could safely eat. They even telephoned the local bakery to find out if any cow’s milk/products had been used in the bread. After our pleasant meanderings over moor and through dales Whitby came as a shock because it was overflowing with visitors. We did manage to find a parking space and wandered around the centre of the town so that we knew where everything was the following day. As it was so hot David introduced me to the very refreshing Costa smoothies. I had done some research into where to eat at Whitby and had realised that we would have a major problem as almost every restaurant served shellfish – and David has a dangerously acute anaphylactic reaction to the minutest amount. For our first evening I had, therefore, packed a picnic. Then it was time to find our lodgings for the night. I had been seduced at the idea of staying in a Jacobean house – and so had chosen Ruswarp Hall. Sadly, our first impression was that the hall had been altered so much over the centuries that it no longer had much charm for us as a building. We felt that even more when we sat out in the garden at the back of the hall and it was obvious that the establishment required a lot more TLC. We did, however, enjoy having access to the honesty bar. We were warned that our room – number four – had a ghostly reputation. For us, however, there were no odd occurrences and we slept very well as the Hall had a comfortable atmosphere untroubled by the ghost. The one thing our room lacked was the internet connection even though free Wifi had been promised. We discussed this the following day with Lizzie, the daughter of the owners. She explained that they were trying to ensure Wifi connection to all the rooms – but, like the ghost, it failed to put in an appearance for us. I certainly enjoyed a good, hearty breakfast on our first morning there – so good that I didn’t need any lunch. We decided to park in the centre of Whitby and explore the old town before we began our excursion on the North Yorkshire Moors Railway. This also gave us an opportunity to use our Northern Museums Volunteer passes as we visited the small but interesting James Cook Museum. On the train we were made very welcome and comfortable by the volunteer staff. The volunteers obviously take great pride in maintaining a high standard both on the trains and also at the railway stations. “It took me back to my childhood as I remembered the days when we used to travel on those sort of trains,” David said. I soon realised I had made a mistake regarding which camera to use. I should have taken my Canon 600D but had opted to carry less, and so took my small Olympus Mu and the camcorder, both of which fitted nicely into my handbag. It didn’t help that I’m very much a novice with the camcorder. The 15 minute stop at Grosmont gave me a chance to use it. After there we soon headed into Grosmont Tunnel. The original, believed to be the oldest railway tunnel, had been built in 1835 for a single-track horse-worked line overseen by George Stephenson. It was hoped that it would open up new markets for Whitby where the whaling and shipbuilding industries in decline. The railway was upgraded to a double-tracked steam one after it was bought by the York and North Midland Railway in 1845. Its ownership changed two more times until it was nationalised and became part of the British Railways network in 1948. It, like many other branch lines, was closed in the 1966 as part of Beeching cuts. 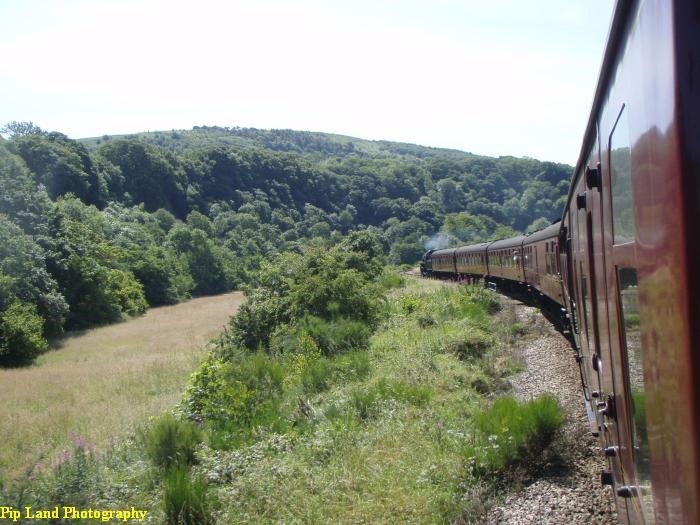 The line between Grosmont and Pickering was re-opened in 1973 thanks to the North York Moors Historical Railway Trust Ltd with most of the engines being provided by the North Eastern Locomotive Preservation Group. For our trip we were yet again fortunate with the weather with clear views and some wonderful contrasts in colour from the purple of rosebay willowherb along the railway bank to the yellow, newly cut hayfields and the woodlands and moors beyond. A kindly NYMR guide warned us when, after Goathland, we were passing the highest point on the railway and then travelling down Fen Bog where the railway lines float on a bed of timber and sheep fleeces – a solution Stephenson had used to cross Chat Moss on the Liverpool and Manchester Railway. We had been told that the food at the Fisherman’s Wife in Whitby was excellent so I phone them to see if we could safely eat there. Wonder of all wonders – I was assured that the chips were fried in a separate fryer so there was no danger of an accumulation of shellfish ‘toxins’ which would affect David. And there were no cow’s milk products in their batter. David was so looking forward to the luxury of having some chips as we waited in the draughty doorway of the restaurant. At last we were seated and could place our order – and then the waitress returned to tell us that the chef had fried scampi in the chip fryer that day. What a disappointment! The following day, after another hearty breakfast we headed for Malton and Eden Camp. It’s People’s War 1939-1945 is amazingly comprehensive, inclusive and detailed exhibits but also overawing. “They have tried to be very representative of that time,” commented David. In some of the huts it was impossible to read all the material. Even so what we did read was fascinating – from the creativity of prisoners of war on both sides to how women contributed to the war effort in Britain. The recreation of the Blitz in Hut 6 and the mournful wait of the siren proved unsettling, however. David was born during an air raid and the siren practices went on for several years after the 2nd World War. So both of us could remember how our parents had reacted so fearfully to that sound which recalled the trauma of the air raids. As we studied the impact of the air raids on Sheffield David also remembered playing on bomb sites. One of the highlights of our visit was that David did, at last, get a plate of chips plus an excellent veggie burger. For me, however, there was no light snack that I could eat even though one of the staff worked so hard to find me something. The publicity for Eden Camp states that you need at least four hours to do justice to the site. After four hours we felt we couldn’t assimilate any more! We had a brief look at the collection of military vehicles and at the display about human torpedoes and then decided it was time to leave. It was a beautiful drive home. After a dull, misty start the sun had come out and the Howardian Hills and the Dales were a delightful sight. Many of the verges were fringed with creamy meadowsweet and violet meadow crane’s-bill. It’s always a joy to drive back into Wensleydale with Penhill standing sentinel over the sparkling River Ure.